Alternative therapies that used to be considered ‘New Age’ are now becoming more popular and mainstream than ever. Back in September we took a look at sound therapy, but over the past few weeks crystal healing has been getting a lot of attention – not least because celebrities and fashionistas like Victoria Beckham, Cara Delevingne, Naomi Campbell and Katy Perry don’t seem to go anywhere without a crystal or two around their neck, in their handbag, or in secret pockets inside their trousers. In fact, Victoria B even called in a crystal healer to bless her London store. Crystal healing is an alternative therapy which uses crystals and gemstones to absorb negative energy and bring balance, harmony and healing to our body, or any other place where we want positive, life-affirming energies to flow. Over the centuries, many cultures have embraced the healing power of crystals and they have even been used in talismans and amulets, to bring good fortune to the wearer and ward off the evil eye. In fact, the origins of crystal healing go at least as far back as the Sumerians and ancient Egyptians. In ancient Egypt, pregnant women would hold an emerald to ward off labour pains and soldiers would wear amethyst to stay courageous on the battlefield. 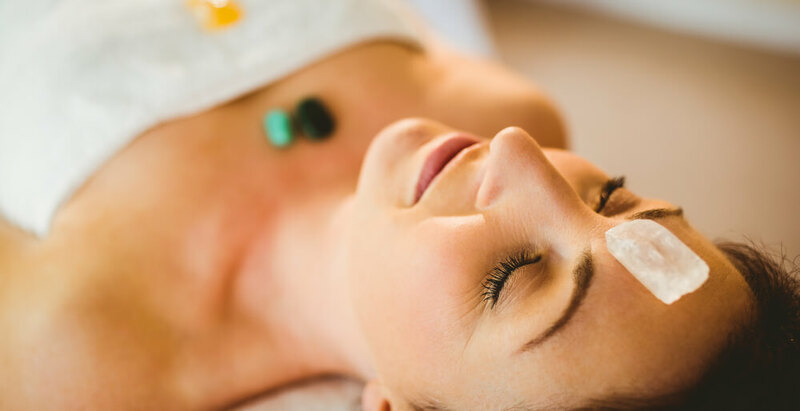 In many ways, crystal healing is a close relation to the Chinese concept of chi (life energy) and the Buddhist belief in chakras, the seven energy centres that are positioned throughout our body from the base of our spine to the crown of our head. The crystals are each assigned different properties: for example, amethyst is good for relaxation and is often used to disrupt negative behaviours and help get rid of addictions… clear quartz amplifies energy and improves balance and focus… hematite stimulates circulation… black tourmaline keeps you grounded… citrine is fantastic for empowering you and getting rid of tension… jade is the stone of wealth, abundance and realising your dreams, and turquoise draws in luck, love and positivity. Okay, let’s take that last point first. Experts say that a crystal can absorb energy regardless of how big or small it is, but a bigger crystal will understandably be more potent. As for choosing the crystal – it’s all about instinct and being open to the moment when the right crystal appears exactly as you need it. If you have a choice of crystals to choose from, try holding them in your hand and tuning in to whichever feels most right. Take your time and you’ll find there will inevitably be one or two crystals which stand out more than the others. Most practitioners believe that your crystals choose you just as much as you choose them. Can a crystal lose its energy? Considering all the negative energies that crystals have to cope with, it’s not surprising that their ‘batteries’ sometimes have to be recharged. One solution is to run lukewarm water across the crystal and dry it gently with a soft cloth (although be careful because some crystals can be damaged by water) or leave it on a windowsill to be cleansed by the sunlight. Alternatively, you could pass the crystal several times through a candle flame. Probably the easiest and safest solution is to place your crystals next to a clear quartz stone, which will dissipate any negative energy stored inside them. If you don’t have a clear quartz, a carnelian stone or a selenite gypsum crystal should do the job just as well. Oh, and don’t worry if you ever lose a crystal. It’s the universe’s way of telling you the crystal has done its work and it’s time to find another. As far as most doctors and scientists are concerned, crystal healing is nothing more than a ‘pseudoscience’ and there’s no proof that it works. But look at it this way: just like affirmations and visualisations, if you’re ready to explore the power of crystals and open yourself up to the energies they may hold who’s to say they won’t work for you? They’re already being used in some forms of massage and reiki therapy. At the very least, crystals have been a part of the Earth since the beginning of time and they can be beautiful objects to own. Why not give them a try and find out what happens?